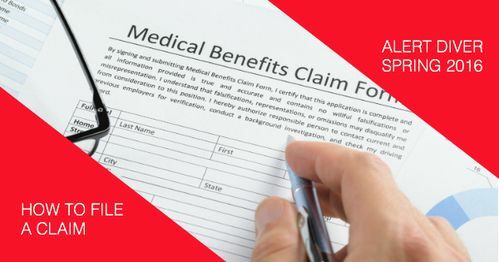 Your how-to when filing a claim for medical expenses related to a diving injury or a travel-related medical emergency covered under DAN-SA membership benefits. DAN-SA is a public benefit organisation that provides emergency medical advice and assistance for underwater diving injuries, and a wide range of research, education and training programmes that promote safe diving. DAN-SA is the insured party of a group policy that offers coverage for diving injuries and a limited set of travel-related medical emergencies. DAN-SA members receive the coverage benefits by virtue of this policy. By proxy, DAN-SA is the beneficiary under the policy. The DAN-SA Group Policy was established primarily to assure essential coverage for the emergency medical assessment, aeromedical evacuation (when medically justified), hospital admission, specialist examination, and recompression chamber treatment for decompression illness (DCI). The group policy also includes other travel medical benefits consistent with the typical needs and activities of divers. Consequently, group policy terms and conditions were developed carefully and thoughtfully in conjunction with insurance experts to ensure that DAN-SA members have appropriate coverage for managing and treating injuries and accidents associated with diving-related travel and activities for which they need emergency medical services and transportation as recommended, authorised and/or mobilised by the DAN-SA Hotline. The terms and conditions have been adapted over the years to offer the best value for coverage relevant to recreational divers. With all this in mind, it is very important that DAN-SA members understand how the group policy works. They need to realise what DAN-SA can and cannot authorise on their behalf, by virtue of the DAN-SA Group Policy, when they require or request emergency medical services based on the benefits of the group policy. DAN-SA is not a medical aid and membership is not an alternative to a medical aid. DAN-SA does not sell insurance and membership is not insurance. DAN-SA is not an insurer; it is the insured party. DAN-SA extends the benefits of its own DAN Group Policy cover to its members. Unless DAN-SA submits a claim to the insurers, there is no coverage. DAN-SA members are responsible for ensuring that their membership is valid. DAN-SA membership cannot be renewed retrospectively to cover a claim during the period in which a membership had lapsed. It is essential for members to alert DAN-SA immediately in the case of a diving emergency or injury. Notify DAN-SA of any remote or overseas travel (using the online registration forms) as this saves time when contacting the DAN-SA Hotline in case of a subsequent emergency. Involving the DAN-SA Hotline is essential to ensure that members receive the appropriate emergency medical services and treatment, and to ensure coverage for the services and treatment. Many medical facilities are unfamiliar with diving-related injuries, particularly DCI. Calling the DAN-SA Hotline is critical to ensure that diving specific aspects are considered in the care of injured divers. It is in the best interests of DAN-SA members to allow DAN-SA to request emergency medical services and treatment directly, on their behalf, and for DAN-SA to offer any necessary GOPs upfront. Unless this is justified by life-threatening situations, services arranged by (or on behalf of) a DAN-SA member without the direct involvement of the DAN-SA Hotline are not covered and may be rejected by the insurers. In the past, the DAN-SA Hotline has been required to indicate the usual and customary actions and costs of services it would have recommended if it had been involved. Although this has been avoided in the past, the member may become liable for any unusual or excessive costs. Claiming back is also more cumbersome and is subject to a longer administrative process. DAN-SA cover is secondary cover. This means that the benefits under the DAN-SA Group Policy should be considered as a “gap” cover. In the case of an individual having no medical aid benefits for the emergency medical treatments needed, no alternative travel insurance or any other primary form of insurance, DAN-SA will authorise and claim for any usual and customary expenses incurred in providing emergency medical care, within the terms and conditions of the group policy. This is the only way in which membership (including these coverage benefits) can remain affordable. Whenever DAN-SA members are asked to submit supporting documentation to facilitate the submission of a claim, it should be understood as being a collaborative process. In other words, members are assisting us in submitting a claim on its own (DAN-SA’s) behalf so that the benefits of the claim can then be made available to the member. Should members be on a medical aid or have travel insurance, all accounts will first be processed by their medical aid or travel insurance. The DAN-SA Hotline will make all the necessary arrangements for your treatment and issue GOPs to the service providers, hospitals or healthcare professionals. From inside South Africa, call us toll free on 0800 020 111. From outside of South Africa, call us on + 27 828 10 60 10. Remember to save these number on your cell phone, especially before travelling abroad. In all situations where coverage is offered under the DAN-SA Group Policy, DAN-SA is required to submit a claim to the insurers on behalf of the member, even in situations where the DAN-SA Hotline authorised these services and provided a GOP directly to the service providers. In unusual situations where a DAN-SA member needs to claim for expenses incurred for emergency medical services arranged without the direct involvement of the DAN-SA Hotline, the DAN-SA Hotline needs to be notified first to register the event. Call DAN-SA on 0860 242 242, or if calling from outside of South Africa, call us on +27 11 266 4903. Members can contact a DAN-SA medic either on 011 266 4903 or danmedic@dansa.org for a claim form. DAN-SA will arrange settlement of all services and expenses for covered services, reconcile any short payments with service providers, and arrange for any reimbursements to be paid out to you. We will also send you a final reconciliation so that they can see what the total pay-out was. Please ensure that your DAN-SA membership is up to date. The DAN-SA Hotline must be notified for a claim to be eligible for processing. A claim form must be submitted to allow DAN-SA to claim for services rendered under the DAN-SA Group Policy cover. DAN-SA will (by law) first attempt to arrange settlement via any relevant medical aid or any other travel insurance that you may have. If you receive any invoices/statements directly from service providers, kindly forward these to DAN-SA. Notify DAN-SA if you are travelling to remote areas, overseas or if you will be outside your country of residence for a continuous period of more than 90 days.